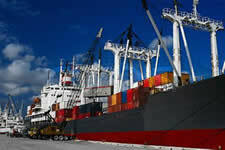 At AMS we specialize in the transportation of Import and Export Ocean Containers (FCL). 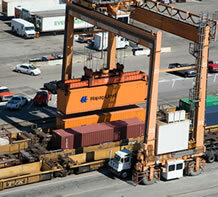 We service all the NY/NJ Seaports and Rail Yards to anywhere in the US . Our strongest deliver to points are the states of NY, NJ, CT, RI, NH, MA, VT, PA, MD and VA. We have interchange agreements with all the Steamship Lines operating out of the NY/NJ Ports and Railyards. Dependability is what best describes AMS. 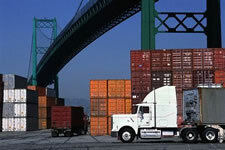 Regardless of the time of day, our dispatch is always available to accomplish your request. Whether it’s an import or export shipment, if there’s a container to be picked up at the port, AMS will assure you that our team of highly professional logistical coordinators will handle your cargo in the most efficient professional manner. Just send us your D.O. and we will handle the rest. 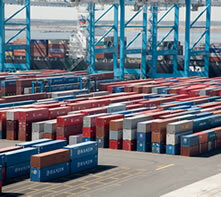 Have a container that has just been discharged at the port? 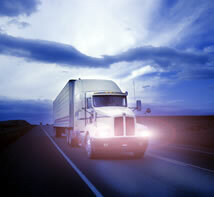 AMS can have it picked up and delivered to your desired destination on that same day. AMS Prides itself in offering overall cost savings and time efficient strategies tailored to meet our customer's requirements. With our fleet of trucks exclusively designated for Port Containers, and our Yard facility strategically located within 2 miles of the NJ Seaports, AMS will meet your every logistical need. Rates may be obtained by simply calling or e-mailing us and telling us from what port point the container will originate from and to what location or port point the container is to be transported to. Our knowledgeable staff is waiting, and always ready to serve you.